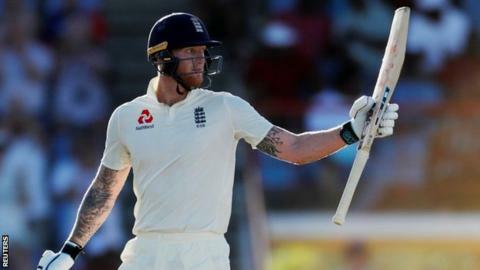 Ben Stokes says England’s batsmen have not approached the third Test against West Indies any differently, despite defeats in the first two. The tourists reached 231-4 on day one in St Lucia, an improvement after being bowled out for 77, 246, 187 and 132 earlier in the tour. “People will say ‘why couldn’t they have this discipline, why couldn’t they have this fight before’,” said Stokes. Even if England have not altered their batting mindset, they have at least made changes to their line-up, with opener Keaton Jennings recalled after being dropped for the second Test, Joe Denly pushed down to number three and wicketkeeper Ben Foakes omitted, with Jonny Bairstow reclaiming the gloves. England slipped to 107-4, but all-rounder Stokes made an unbeaten 62, sharing a stand of 124 with Jos Buttler, who is 67 not out. Stokes was the benefit of a reprieve on 52 when Alzarri Joseph was found to have overstepped after the Durham man slapped a return catch back to the bowler. In the time it took for the decision to be reviewed and overturned, Stokes had left the field, put some of his kit on the boundary edge and returned to the dressing room. In the past, leaving the playing area would have meant the end of Stokes’ innings, but a change to the Laws in 2017 meant he could resume because the next delivery had not been bowled. He was alerted to the change in decision by batting coach Mark Ramprakash and re-emerged from the dressing room, passing next batsman Bairstow, who had already got part of the way to the wicket. “I thought my day was over,” he said. “I got into the changing rooms and just sat there. I actually thought Jonny had got out first ball, that he was walking off and that was a no-ball. “I’m lucky. I don’t take my kit off until 10 or 15 minutes after I’m out. Some people take their kit off right away. If that had happened, I don’t know what would have happened. Stokes did, however, question the time taken for the correct to decision to be made. “In international cricket, with all the technology and cameras around, it shouldn’t take that long to get someone back out,” he added. “I’ve never walked off the field and then gone back in. Stokes had been a doubt for this Test because of a heel problem, but confirmed he will be fit to bowl. Before then, he said that he and Buttler will be looking to build on England’s first-day performance.